If you’re going surf fishing or taking out your own boat, you will need to buy some bait before you hit the water. There are lots of options for buying some bait you can use for your Destin Florida fishing trip. Along with the bait, the bait shops offer other items that can enhance your fishing trip. If you are taking out your own boat, consider buying bait at the Destin Marina. Don’t limit your purchase to bait, though. You can also get beer, ice, and snacks from the Destin marina. Once you purchase everything, you can use the boat ramp to take off for your Destin Florida fishing trip. All of this makes the marina a great place to buy bait. Half Hitch Tackle is another great choice for bait. You can get live bait and equipment from this shop. In addition, it has other outdoor equipment so you can get everything you need for a fun vacation in the great outdoors when you go to Half Hitch Tackle. You can also get some live bait from Jugheads Live Bait. They catch and sell bait, and specialize in cigar minnows. You can also ask the owner to catch other types of bait for you, including chauffers, hard tail, and mullet. Finally you can go to one of the major retailers to buy some bait before you go on your Destin Florida fishing trip. Walmart, Bass Pro Shops and other major retailers sell a variety of bait. Stop by any of these places to get the bait and equipment you need for your Destin Florida fishing trip. Then, use your skills to reel in some big fish. Consider taking your cleaned fish over to one of the local restaurants so they can prepare it for you. 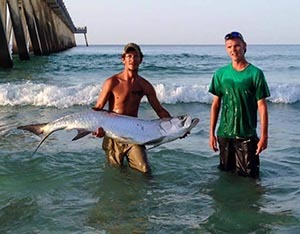 This entry was posted in Destin Florida Fishing. Bookmark the permalink.